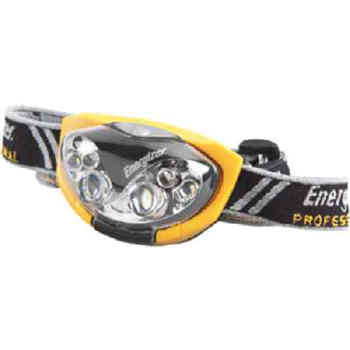 Energizer’s 6 LED Industrial Headlight runs up to 19 hours on three, Energizer Max®, AAA alkaline batteries (included) and features four lighting modes—spot, flood, spot + flood, and night vision. Comfortable headband includes grips with pencil holders to mount securely on a hard hat. Headlight uses six LEDs: (2) white spot, (2) white flood, and (2) red night vision. 2 3/4"L x 1 1/4"H x 1 1/4"Dia.